Yard sales are places to find unexpected treasures, but when I stopped at one last year I never knew the treasure I found would be a new artist for Wenaha Gallery. I mean, I was just looking for little boy baby clothes. There weren’t any. 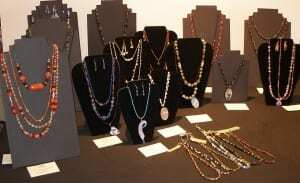 But what there was were colorful, unique, and trendy necklaces and earrings — an entire tableful. “Did someone make these?” I asked two women sitting in chairs nearby. 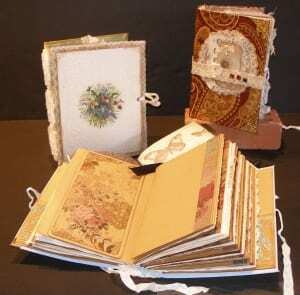 And so I discovered Dawn Moriarty, a geriatric nurse at Booker Rest Home in Dayton, WA, who prolifically fashions in her spare time not only chic jewelry, but nostalgia journals assembled from repurposed paper products. She works out of a “woman cave” studio in the basement of her home, and many years ago turned to both jewelry and paper crafts as a means of bringing a peaceful balance to her life. Not wanting to fuss with a website or Etsy store, she stored her art in boxes. When one was full, she took it to work and sold to friends and coworkers. “The positive feedback there would ‘fuel my fire’ and keep me inspired to create,” the Dayton artist says. But at some point, there was more artwork than co-workers, and Moriarty looked around for other places to share her wares: hence, my fortuitous discovery at the yard sale. 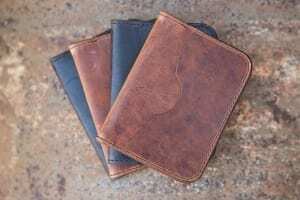 An added bonus were the nostalgia journals, a high-demand item that Moriarty brought into the gallery on a whim, unsure of how they would be received. 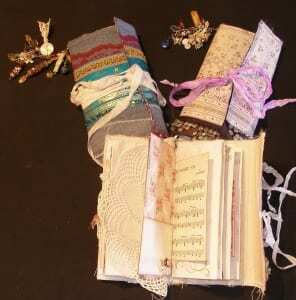 Quite fortunately, Moriarty loves spending time in her woman cave, dividing time between the journals, jewelry, and yoga. When she isn’t in her domestic subterranean environment or working, she’s on the hunt, scouting out raw materials. This activity she describes as being as fun as creating the art. “To find the material for my journals, I go to antique stores, junk shops, yard sales, estate sales, secondhand stores, library sales — anywhere I might find objects that I can re-purpose and reuse,” Moriarty explains. “Once in an antique store in La Grande, OR, I found an 1889 original almanac, and in the spine was an old sewing implement, kind of flat, metal with engraving on it and some brown wool thread in the eye — it’s beautiful! “I look for used paper products from tags, receipts, stationery, old sewing patterns, diaries, textbooks, ledgers, and so on. I also look for vintage textiles from fabrics to trims and lace. That’s just for the journals. For the jewelry she routs out vintage glass and metal beads — she has a selection that were once on a beaded curtain in an old shop in Seattle. Gems and semi-precious stones she sources from Shipwreck Beads in Lacey, WA, where she makes a yearly trip to stock up. And the polymer clay beads she creates in her woman cave, a happy place of relaxation and inspiration. “Working with polymer clay is a great stress reliever. There is a lot of squishing and squeezing going on. Each piece, whether jewelry or nostalgia journal, is a statement, Moriarty says, and the basis of that statement is the vintage status of the materials she uses. Not only does this ensure that each piece is one of a kind, never to be replicated anywhere, it also adds feeling, significance, and humanity. “I love knowing that each piece has a history,” Moriarty says. “I wonder about the lives that it touched. 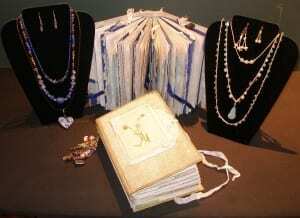 There’s a connection to the sentimental value of each item, whether it’s jewelry or a journal. 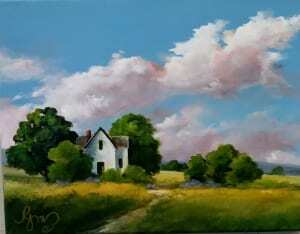 Dawn Moriarty is the Featured Art Event from Monday, April 22 through Saturday, May 18 at Wenaha Gallery. 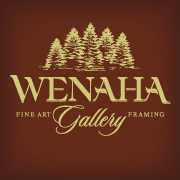 Contact the gallery, located at 219 East Main Street, Dayton, WA, by phone at 509.382.2124 or e-mail art@wenaha.com. Gallery hours are 9 a.m. to 6 p.m. from Monday through Saturday, and by appointment. Everyone has a camera these days. Whether it’s at an office party or the family Thanksgiving dinner, many people have been buttonholed by an enthusiastic traveler’s sharing a (seemingly endless) collection of photos. It doesn’t take long to realize that enthusiasm does not always equate with expertise, and while anyone can press a button, far fewer people know how to capture a moment, a memory, and an emotion. 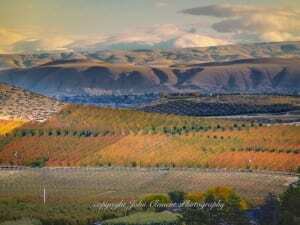 “The challenge of being a photographer is capturing the images that I have created in my mind’s eye — capturing an emotion that connects someone with that image and draws them into it,” says Kennewick photographer John Clement, who has had a camera in his hand for more than 49 years now and counting. Clement’s story started in 1970 at Central Washington University in Ellensburg, where he double majored in geology and geography. Needing an elective class to fill a gap in his schedule, he chose photography — although to get through the class he had to borrow a camera because he didn’t own one. “But I was hooked,” he said. He spent five years with a church pictorial directory company in St Louis, and another five with Battelle in Tri-Cities doing lab and photography assignments. 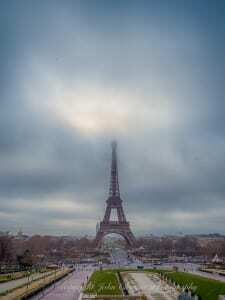 On the side, he shot landscapes and marketed his work, and in 1980, left Battelle to venture out on his own. “I’ve been really blessed in this business by faithful clients and opportunities to try new ventures in photography,” Clement explains. “I’ve been involved in book publishing, calendars, multimedia production, and scouting movie locations for clients in California. Clement’s photos have garnered more than 65 regional, national, and international awards, including first place at the National Park Service’s National Natural Landmark Photo Competition. 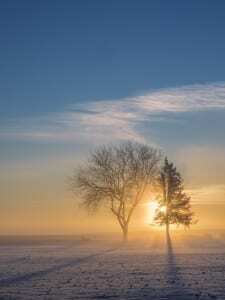 He has been published in Country Music and Northwest Travel Magazines, and one of his prints hangs in the permanent collection of the International Hall of Fame of Photography in Missouri. He installed 17 of his works as murals at the Century Link Field in Seattle, home of the Seahawks and the Sounders, and an additional 17 as 4×8 glass panels at the recently remodeled Pasco Airport. Last year he completed a major project at the Othello Medical Clinic where nearly 200 images — ranging in size from 24 inches to 35 feet — decorate the facilities. “I have thousands of stories — some funny, some serious, and some scary,” Clement says. “When you do what I do, you can get into some interesting situations, places, and crazy scary weather.” One major memory is the time he lugged his 42 pounds of camera equipment onto a four-foot wide, mid-range ledge at Palouse Falls. Without warning, a baseball-sized rock hurtled from above, barely missing him. “Quit throwing rocks! There are people below you!” Clement shouted to the voices overhead. The next voice he heard was that of an upset mother yelling, “I told you not to throw rocks, didn’t I?” There was a slap, a wail, and then silence. But at least there were no more rocks. Clement stayed on the ledge, unmolested from above, for four hours, waiting until the light and the sky were just the way he wanted. It’s his job, he says, to capture that moment on camera, and translate it visually into an image that speaks to the heart as well as the eye. “I believe God has given each one of us a gift to share with others,” Clement says. 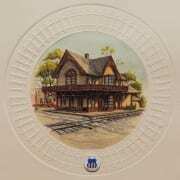 John Clement is the Featured Art Event from Monday, April 8through Saturday, May 4at Wenaha Gallery. He will be at the gallery Saturday, April 13, from 10 a.m. to 2 p.m. for a special Spring Art Show, where he will be joined by Milton-Freewater steel sculptor Anne Behlau and Dayton jewelry and nostalgia journal artist Dawn Moriarty. If you ever have a run-in with a porcupine, you’ll probably remember the experience. Anne Behlau certainly has. “When I was a six-year-old child, a porcupine came into the tent I was sleeping in with my brother on a mountain pack trip,” the Milton-Freewater metal artist recalls. 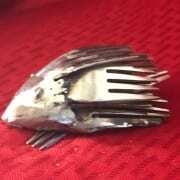 Years later Behlau, who creates steel sculpture from found, repurposed, and recycled metal, fashioned a forkupine, a whimsical, 3-D statuette of a porcupine created from forks. A retired registered nurse, Behlau grew up on small farms, and has been involved with animals all her life. As a young adult she moved to Dayton and raised four children on a 100-acre farm on the North Touchet, and after the kids grew and flew, went back to school for her RN degree. After 27 years of working in the medical field, she retired and turned to the welder, torch, and blacksmith forge. She now also trolls through salvage yards, junk piles, yard sales, and farms looking for metal materials to transform into her art. “My father was a blacksmith and farrier,” Behlau explains. “My brothers continued the tradition as well as my nephew. There is a learning curve, she says. In the three years she has been honing her skills with her tools, she has encountered challenges along the way. “Working with red hot metal can be tricky and painful at times if you are not careful,” Behlau says. “The upside of working with metal is that, unlike with wood, if you cut it wrong or put it together wrong, it is very forgiving. Citing a love for all things cowboy, Behlau expresses enthusiasm for creating metal sculptures of horses, ranging from the whimsical to serious. While raising her children, she threw herself and them into 4-H and FFA. Nowadays, that love for horses comes out in the work of her hands. 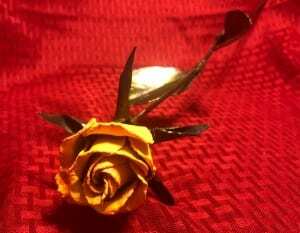 Yellow Rose, metal sculpture by Milton-Freewater artist Anne Behlau. Behlau does not limit herself to equine subjects, however. All farm and ranch animals, as well as porcupines, attract her interest, along with flowers, people, and graphic design shapes. 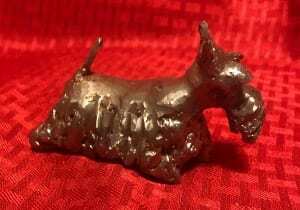 Her two Scotty dog pets provide constant inspiration, and she has created a 30-pound Scotty sculpture using sections of heavy walled metal pipe, as well as a tiny Scotty, fashioned from a railroad spike. People who see both sculptures express surprise over what makes up the finished product. 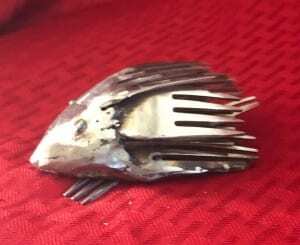 From forks to garden tools, from scraps of farm machinery to old horseshoes, they all find themselves with new life in a new shape, after a little bit (or quite a lot, actually) of heat and inspiration. What Behlau ultimately creates depends upon the materials she has gathered, along with ideas she picks up from the Internet, personalized by her own spin. Working out of an unattached shop/garage at her Milton-Freewater home, Behlau markets her work as Anvil Annie Metal Art. She has sold her pieces as a vendor at festivals, through her Facebook page, and at Hamley & Company Saddle and Western Store in Pendleton, OR. Learning as she goes with “a little instruction along the way,” she never quite knows what she will make next, but is certain that it will reflect her love for country and for country life: its people, its animals, its lifestyle. 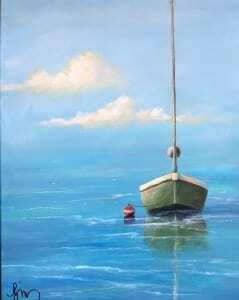 Anne Behlau is the Featured Art Event from Monday, March 25 through Saturday, April 20 at Wenaha Gallery. 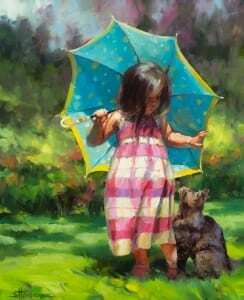 She will be at the gallery Saturday, April 13, from 10 a.m. to 2 p.m. for a special Spring Art Show, where she will be joined by Kennewick photographer John Clement and Dayton jewelry and nostalgia journal artist Dawn Moriarty. In the back of our minds, “they” always speak. Who “they” are is a mystery, but their voice — if we let it — dictates what we do, how we do it, and who we do it with. Call it peer pressure, societal norms, tradition, or propaganda from the advertising industry, all people feel it in some format or another, and how we deal with “them” impacts how we live our lives. “According to the rules, you are always supposed to have a plan, but my plan is constantly changing,” says Yakima fine art painter Becky Melcher, who has spent most of her life not listening to the voices of convention. During the 1970s, to pay for college in Los Angeles, Melcher got her pilot license and ferried airplanes between the Santa Monica and Van Nuys airports, but while she loved flying, she wasn’t so excited about where all her money was going. “College seemed to promise nothing, so I eventually quit and went to work for a law firm summarizing depositions. Back in the day there weren’t very many college paralegal programs, so this was learned on the job. I was self sufficient and independent! She married, had triplets six months into her pregnancy, and eventually arranged to work from home, summarizing depositions for a local law firm. And when she could, she painted: representational landscapes during a time when abstract was the art world’s favorite child. After 40 years of being in the legal field — ranging from working for a government contractor making parts for nuclear submarines to administrating the business office of a private law firm — Melcher retired and threw herself full time into what she never had time enough for before. 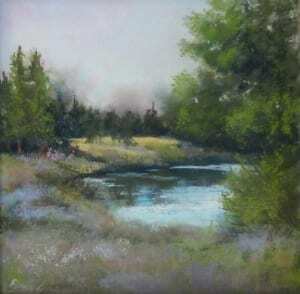 Finding that watercolor “doesn’t allow for change of mind,” and oils require more patience than she has, Melcher focused on acrylic paintings, with her favorite subject matter being landscapes. “They draw you into a story that the artist is telling — You can live in landscape paintings! Working out of what she describes as “a tiny office in my home — more tiny art studio than office,” Melcher has created a body of work welcomed in various area restaurants, wineries, and businesses, from which she makes brisk sales. 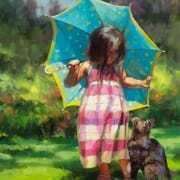 Buyers have mentioned that they like the feeling and emotion of her works. 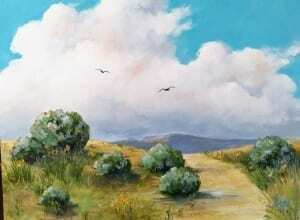 Well Traveled Path, acrylic painting by Yakima artist Becky Melcher. She listens to her heart and mind before she pays attention to what “they” say. One of the next items on Melcher’s learning list is exploring the world of abstract, with the idea of incorporating it into representationalism. She aims to bring out the best of each. “They” may disagree, but then again, Melcher isn’t concerned with them. Each artist, Melcher believes, is a unique individual, and must be free to paint in accordance with their heart, soul, skills, vision, and being. There is no room for an imperious, monolithic voice imposing its views upon the world, dictating what is, and isn’t art. “I love reading what other artists have to say about their vision, journey, and focus of artistic endeavor,” Melcher says. Becky Melcher is the Featured Art Event from Monday, March 11 through Saturday, April 6 at Wenaha Gallery. Within each day, we do a lot of things, say a lot of things, without knowing what impact one particular action will make on another. Artist Jeremiah Colladay found that a simple gift from a friend resulted in a complete career change, as well as the building of a business. 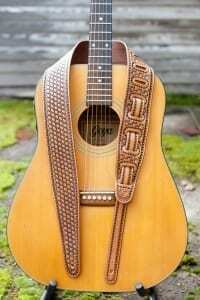 “Most of my childhood was spent playing the drums and guitar, filling my sketchbooks with pencil and ink drawings, and innovating new products from objects I found around the house,” the Spokane craftsman, who specializes in creating Western leathercraft with a decidedly Pacific Northwest style, says. Colladay tracked down a custom saddle maker, with whom he embarked upon a three-year apprenticeship, learning what is today considered a dying art. He learned how to create patterns that transferred well to the medium, how to properly sew leather, and how to carve, tool, and dye it in such a way that the artwork emerged, strong and integrated. 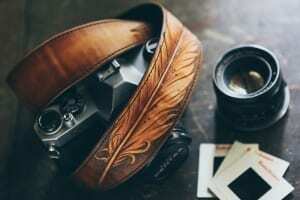 Upon completing his apprenticeship, Colladay collaborated with his writer and photographer wife, Erin, to establish Colladay Leather. He creates the products; she manages the business. They both design. Working out of a studio that takes up most of the daylight basement in their rural north Spokane home, the couple fashions hand-carved, hand-beveled, hand-shaded, and hand-dyed products from leather, with no two exactly alike. 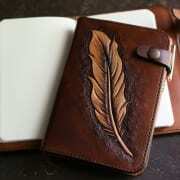 In addition to making wallets and journal covers, items that many people associate with leather, Colladay Leather designs and crafts earrings, zipper pulls, camera straps and guitar straps from leather tanned exclusively in the U.S., a policy the couple created in order to maintain high standards of quality, as well as assurance that the material has been produced under sustainable conditions. “Our passion is for artistry and the creative process, in all its forms,” Erin says. There’s something about the artisan process, she muses, that evokes passion and wonder, which thereby translate into a quest for excellence in all arenas of life. The couple develops and expands its product line through close communication with customers, as well as a streak of practicality. For example, Jeremiah developed the popular three- and seven-pocket tool rolls to address the frustration he experienced while pawing through a pencil pouch to find the tools he needed. The tool rolls streamlined and organized pens, pencils, and other small tools that otherwise jumbled together. Inspiration for artwork on the products arises from the Inland Northwest itself, its landscapes, flora, and fauna, as well as Jeremiah’s background in tattooing. What results, Jeremiah says, is a unique piece of art, one that is also functional. It can be worn and used daily. 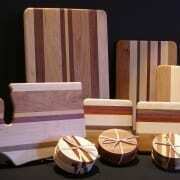 “When you hold our products, you are asked to slow down and take heed of quality and beauty,” he explains. “An encounter with our work inspires you to pursue creativity and excellence in your own work, be it in the boardroom, the emergency room, the kitchen, or the studio. 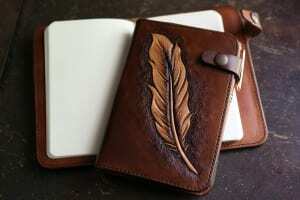 As beautiful as leather is, it is a difficult medium in which to work because of its unforgiving nature. Any cuts, indentations, or nicks made to it are permanent, and once the dyeing process begins, things get especially tricky. “One small slip of the brush, and you can undo hours of intensive work,” Jeremiah says. But that’s all part of crafting, and craftsmanship — the careful attention to detail, as well as the time it takes to create a functional item of beauty. “Crafted to Inspire is our guiding principal,” Jeremiah says. Jeremiah Colladay is the Featured Art Event from Monday, February 25 through Saturday, March 23 at Wenaha Gallery. All humans make plans, but frequently forget something most important: the only thing certain about life is that it’s uncertain. For artist Barbara Coppock, the last thing on her mind when life hit hard was Burns’ musings “To a Mouse, on Turning up in Her Nest with the Plow,” but she, like the mouse, found that plans she made for the future could change, drastically, in a microsecond. After her daughter and son graduated from high school, the Clarkston, WA, artist ordered a small printmaking press to pursue intaglio etching. As she had done with many other art mediums, Coppock planned to research and work with this new venture until she had learned all the ins and outs of the method. It would be a slow, enjoyable process, upon which she would focus all her concentration. In addition to being caretaker, Coppock needed a plan, a means of making money that allowed her to remain by Bill’s side — and that’s where the printing press came in. “The answer was right in front of me: printmaking,” Coppock says. 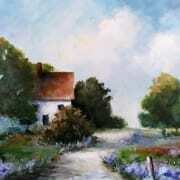 “As I was working out the intricacies, Bill was regaining use of his right hand by working on framing for my etchings. The couple outfitted an RV so that Bill could travel. A friend who showed work at the C.M. Russell show in Great Falls, MT, introduced directors to Coppock’s work, and they invited her to the prestigious annual event. While at the show, Coppock attracted the interest of various galleries, and in a short time was represented by more than 20 — in Great Falls, Missoula, Helena, Ennis, Bozeman, Billings, and Lewistown. On the Oregon Coast (“I never saw the ocean until I was an adult — love at first sight,”) Coppock picked up galleries in Cannon Beach, Newport, and Bandon. 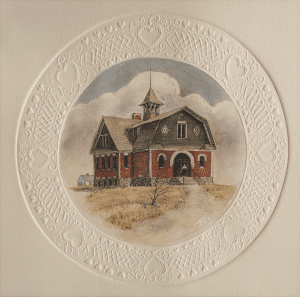 From the mid-80s, through the 90s, and until 2008, Barbara and Bill worked as a team, at one point selling more than a thousand etchings a year through Coppock’s network of galleries. “Art was good to us, and we were able to follow a dream,” Coppock says. 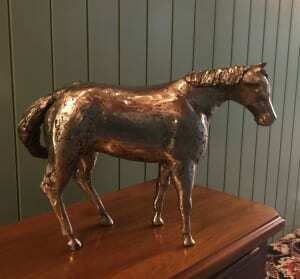 “It was very hard to realize that Coppock Etchings were being collected, some across oceans. Several collectors had amassed over 60. Though they were able to travel only a few weeks each year, Coppock planned and used the time well, focusing on the subject matter of an area to develop a niche portraying homesteads, towns, local landmarks, and landscapes. Believing that the land we choose to care for, and the things we build upon it, define us, Coppock created images connecting viewers to the space with a simple glance. “This look at the past helps us to understand those who were here before,” Coppock explains. It was a good time. It was a memorable time. But it was a finite time, and like all such times, came to an end — in Coppock’s case, quite abruptly. The Old Civic Theater — how many people had plans to attend and enjoy a night at the theater! Intaglio print etching by Barbara Coppock of Clarkston, WA. Almost overnight, plans changed, and Coppock went from selling in 20-some galleries to five, the rest having failed in the economic downturn. Dialysis for Bill and regular trips for treatment cut into the hours Coppock needed for the time intensive etchings. Like the mouse in Burns’ poem, Coppock found her life turned upside down. And she told herself that there was a time and season for everything, and this particular season belonged to Bill. In 2015, when Bill passed away, Coppock found herself, again, looking at an uncertain future and figuring out how to interact within it. She moved from Montana to Clarkston, WA, to be close to family. “So here I am, rebooted. “I was at the top of my game when the unplanned hiatus came calling in 2008. I have a lot of unfinished editions and artist’s proofs that need to find home. 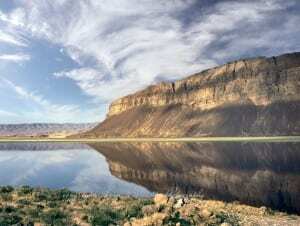 “The big bonus is Southeast Washington is filled with subjects calling my name. 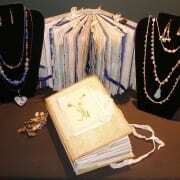 Barbara Coppock is the Art Event from Monday, February 4 through Saturday, March 9 at Wenaha Gallery. 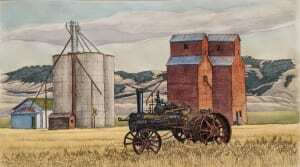 Her etchings include familiar and nostalgic scenes of the west and Pacific Northwest. 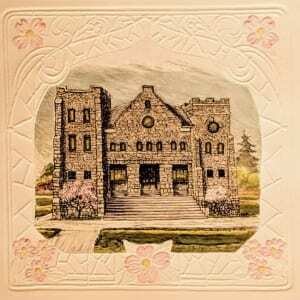 Contact the gallery, located at 219 East Main Street, Dayton, WA, by phone at 509.382.2124 or e-mail art@wenaha.com. Gallery hours are 9 a.m. to 6 p.m. from Monday through Saturday, and by appointment. 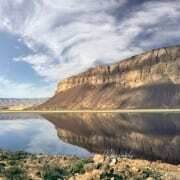 Visit the Wenaha Gallery website online at www.wenaha.com. 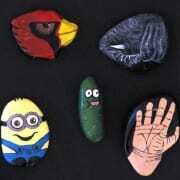 A series of painted rocks by Dayton artist Jaqulyn Silvester, who has been painting rocks for more than 25 years — long before today’s trend. Rocks, these days, really rock. Long overlooked because they’re so ordinary, humble rocks are newly feted as works of art that carry an inspiring message. “I love the idea of putting little random gifts of art out into the world, to bring joy to a stranger,” says Mary-Jeanne Smith, a resident of Dayton who has been painting rocks, and hiding them throughout the community for others to find, for a little more than a year. She is one of thousands of people around the nation who have joined the painted rocks grass roots movement, inspired by life coach Megan Murphy from Massachusetts. In 2015 Murphy wrote “You’ve got this” on a rock and left it on a beach in Cape Cod. After a friend found it and told her how the message had lifted her spirits, Murphy started the Kindness Rocks Project, encouraging others to paint “random acts of kindness” on rocks and leave them out for others to find. 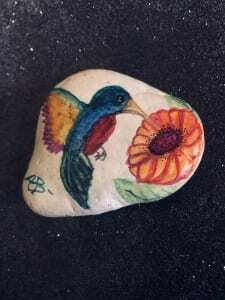 “I painted my first rock, a dragonfly, in 2016 and it was so terrible I put it away and decided rock painting was not for me,” says Ashly Beebe, also from Dayton. Two years later she discovered and joined a Facebook rock painting group from Dayton and participated in its monthly challenges which honed her skills and techniques. Now she hides her rocks throughout town, focusing on busy streets and parks — especially in and around statues — because she wants people to find them easily. 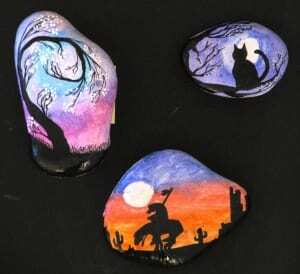 Silhouette magic — painted rocks by Dayton artist Felice Henderson. 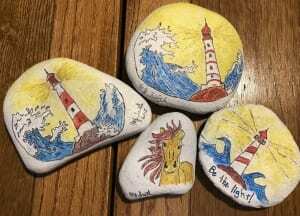 Part of the rock painting movement is posting found rocks on the local Facebook rock painting group, and many cities and geographical areas host one of these. Rock painters regularly check their local groups to see who has found their rocks and where, delighting in the stories and the smiles. 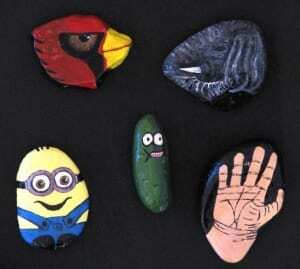 For Dayton resident Felice Henderson, hiding the rocks is as much fun a painting them. On family walks through town her two children, 9 and 4, decide the final hiding place, which is sometimes really really obvious (the four-year-old’s choice) and sometimes not. Henderson remembers their own discovery of a special rock while vacationing on the coast, and it drove home to her how meaningful the ordinary rock has the potential to be. That story pierces the soul. Others are more lighthearted, such as Walla Wallan Nathan Martnick’s reason for starting to paint rocks in the first place. “I once hid a rock in the pocket of the Waitsburg Founding Fathers’ statue,” Waitsburg rock painter Sonya Taylor says. She gravitates toward a “theme” when it comes to hiding places, with Jubilee Lake designated for nature images like kayaking, ducks, and fishing, and the Dayton General Hospital Therapy Department housing her Pokemon rock during last year’s Halloween theme. That’s what it all comes down to: taking an ordinary item; transforming it into a thing of beauty; and placing it someplace where a total stranger will find it. The combination of all these elements is what keeps many people painting and hiding rocks. It’s an individual mission of spreading kindness, encouragement, and goodness. Rock Artists is the Art Event from Monday, January 28 through Saturday, February 23 at Wenaha Gallery. A number of regional rock art painters are displaying their work — in plain site — at the gallery. Rocks will be available for purchase for $10 each. You don’t have to be smart or rich, technologically savvy, rugged, scientific, or glittery — attributes our society admires so much that we confer a state of godhood on those who possess them. Faces are famous basically because their owners make a lot of money, and this means — experts explain — that they are also good and friendly and likable, generous and giving, so totally wonderful that ordinary mortals cannot possibly affect the world in the way they can. Their philanthropy and good works, we are told, make a REAL difference. But how so very, very untrue. Aside from the misconceptions that monetary success goes hand in hand with moral virtue, that those who wield power are intrinsically benevolent, that intelligence equates wisdom, mass media’s fallacious teaching also implies that ordinary people do not possess anything meaningful enough to be worthwhile: we are not rich enough, smart enough, powerful enough, beautiful enough, funny enough. But anybody can be kind. And kindness always makes a difference. Think about it: on a day in which you were feeling low, discouraged, tired, bitter — what was the impact of a stranger’s kindness: a smile, their waving you on to the parking space they were aiming at for themselves, their handing you the dollar you lacked to pay for your purchases? While the action was small, it made a subtle alteration to your day. A world where kindness prevails is like a peaceful landscape, one where there is silence and beauty. 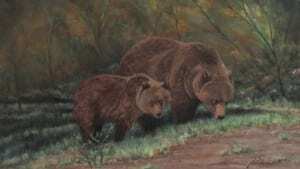 Near Indian Caves, original pastel painting by Bonnie Griffith. That small act of kindness defused a situation in which you were being harmed. No huge check was involved, no photo op, no praise from a talk show host. Just an ordinary person chose to do something kind in the course of his or her day. Such a person, making a habit of this, adds small jolts of goodness to various people’s lives each and every day. A number of such persons makes an impact large enough to be noticed, altering the environment around them from one of criticism, judgment, and indifference to one of caring, compassion, and thoughtfulness. Kindness. The opportunities to be kind are boundless, the need so great that we don’t have to actively look for them, but rather, be ready to act at a moment’s notice: smile, defer judgment, refuse to be baited into an argument, defend a person who can’t speak for himself, donate a can to the food bank, bite our tongue instead of use it as a lash, give to someone who asks without worrying about whether they are trying to cheat us. It’s not a matter of being doormats — we definitely need to stand up for ourselves against powerful establishments whose motives have nothing to do with kindness — but when it comes to dealing with individual people, we rarely err on the side of too much kindness. In short, we act toward others in the way that we wish others would act toward us. And just because we feel they don’t is no reason for us to wait until they do. Determining to be kind is a true act of leadership — not the pseudo-leadership of false confidence and blustering swagger — but a decision to do what is right, to speak what is true, to be a person of integrity in a world that laughs at innocence and equates it with stupidity. Can you imagine what the world would look like if everyone were? 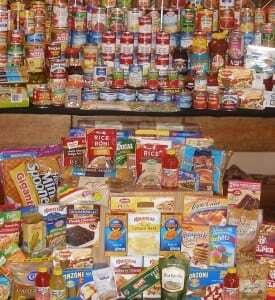 The Annual Canned Food Drive is the Art Event through January 31, 2019 at Wenaha Gallery. For every canned food item brought into the gallery through January 31, the giver receives $2 off their next custom framing order, up to 20% off total. All proceeds benefit the Dayton Community Food Bank. It comes in a variety of neutrals, tans, browns, and even purples. With common sense and lack of greed, it is sustainably harvestable. And in the hands of a skilled woodworking artist, wood is an elegant medium for creating sculpture as well as artisan items we use every day, from wine stoppers to treasure boxes, from bowls to cutting boards. 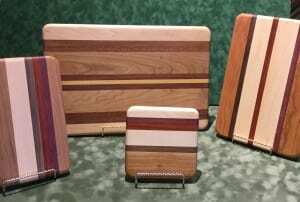 It is these latter — cutting boards — that Spokane woodworker Dave Ulmen focuses upon, crafting cheese, sushi, and cutting boards, as well as coasters, Lazy Susans, and wine waves from laminated hardwood in his Spokane shop. Working with his wife Liz, Ulmen has built a thriving business from what started out as the extension of a lifelong interest. “There is the satisfaction of creating an interesting and useful object that is pleasing to the eye and gentle to the hand,” Ulmen says. Purchasing hardwood from local distributors a hefty pickup load at a time, Ulmen designs boards with the grain and unique coloration of individual hardwoods in mind. He and Liz saw, joint, glue, sand, finish and oil the completed boards, with each woodworking product passing through their hands multiple times. 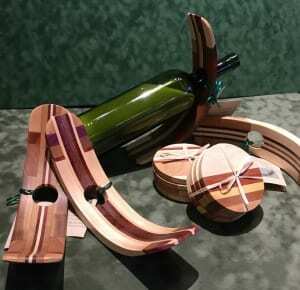 The wine waves, which incorporate bits and pieces (“post production materials”) into a signature curve, vie with the cutting boards for popularity. Ulmen sells his work throughout the Pacific Northwest in numerous gift shops and galleries, including Made in Washington stores; The Highlight Gallery in Mendocino, CA; The Real Mother Goose at the Portland, OR, International Airport; Northwest Handmade Gallery in Sandpoint, ID; and Wenaha Gallery in Dayton, WA. He has shipped to customers in more than 20 states, throughout Europe, and in Canada. In 2007, Made in Washington stores named him Artist of the Year. 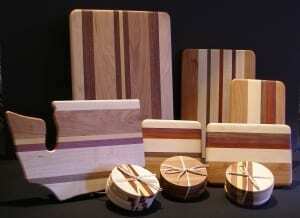 As a testament to that commitment to quality, Ulmen and Liz still own, and use, the first cutting board they made. “We just rinse it, wipe it to damp/dry, and stand it on edge to finish drying. We recommend a beeswax/oil emulsion be applied from time to time which we also make and can supply. 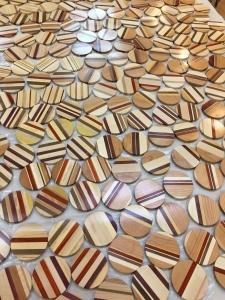 In some ways, the properties of wood — its sustainability, its variety, and its connection to the earth and to the past — mirror Ullmen’s own experience in woodworking. He always knew that somehow, he would follow his grandpa’s and father’s interest in and skill with a material that has been part of humankind’s experience ever since there were trees. “I knew I had the right background to become a woodworker when the time was right,” Ulmen says. It took time to fulfill the dream, but then again, everything about wood, from the growing of trees to the crafting of functional items of beauty, takes time as well. Dave Ulmen is the Pacific Northwest Art Event artist at Wenaha Gallery from Monday, December 31 through Saturday, January 26, 2019. 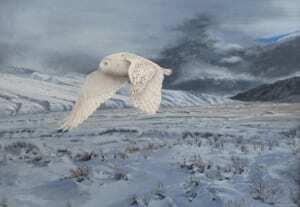 Storm Coming, original acrylic painting by wildlife painter Keith Rislove of Salem, OR. If the world existed of only science, there would be no art. If all people focused on technology, no one would create paintings. If there were only engineers, there would be no poets. 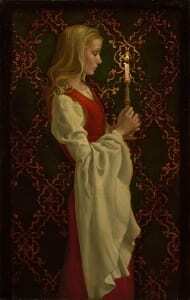 In math class, there is no time or reason to discuss literature. Life without art is incomplete, and just tucking it in alongside the “important” subjects — science, technology, engineering, math and saying this adds STEAM to the mix — isn’t enough. Being an artist demands as much time, focus, intelligence, and determination as being a rocket scientist — whatever a rocket scientist is — and many people who consider themselves artists pursue this path even in the midst of doing something else to make a living. The very fortunate ones find a career involved with art, honing skills and abilities throughout their lives. Keith Rislove is one of these people, a lifetime artist who actually started out to be a baseball player, and credits his experience in the Korean War for his eventual career choice. 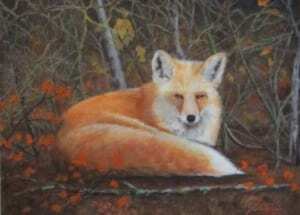 “When I was in high school, I studied art, and I also played all the sports — after graduation I received two offers from major league teams,” Rislove, a wildlife acrylic painter from Salem, OR, says. Like many young men of the early 1950s, he found his plans rearranged for him, and a few months after high school was in the Air Force. During his three years in the military, he was assigned to work with an event coordinator doing graphic arts, and when that event coordinator left, found himself with the job. “That’s where my art career began,” Rislove says. “After being discharged, I enrolled in Lewis & Clark College (Portland, OR) where I was an art major, then majored in advertising and graphic design at the Los Angeles Art Center.” Over the next 37 years, he worked in advertising and graphic design for national and Pacific Northwest companies, in addition to being a freelance designer, retiring in 1990. Five years later he started his second career as a fine artist, still going strong 23 years later. 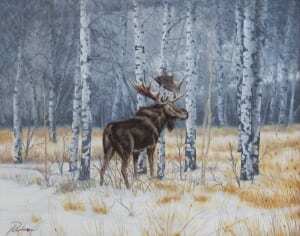 He focuses on wildlife set within pristine outdoor scenes. “My love for the outdoors started with my grandfather who introduced me to fishing and hunting at a very early age,” Rislove explains. A prolific painter, Rislove fits everything he needs into 6 x 10 foot enclosed space in his garage, complete with window, heat, air, shelves, two bookcases and a filing cabinet. He has shown in galleries in the Salem and Portland areas, as well as the Oregon State Fair, and has served as show judge, teacher, and volunteer for various community art agencies and galleries. His roster of awards — displayed within that 6 x 10 foot studio — include three Best of Show, two People’s Choice, eight blue ribbons, two Judge’s Choice, and a bevy of red, white, honorable mentions, and senior artist awards. His work is in the homes of collectors throughout the Pacific Northwest, as well as Texas and Minnesota. Getting into some math here, since we started out talking about STEM, 37 years as a graphic designer, plus 23 years as a fine artist, add up to 60, not to mention the time spent with art in high school and the military. Regardless of the final, official number, this signifies a lot of years as an artist — sketching, drawing, painting, creating — and Rislove’s contribution to the world around him consists of showing that world just what is around it — the wildlife that is hidden away, frequently unseen, but extraordinarily beautiful. There is a fox, curled up within a bed of wildflowers. 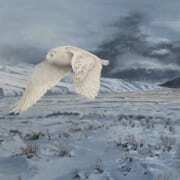 A snowy owl flies over a winter landscape. Mama bear and cub forage for food. 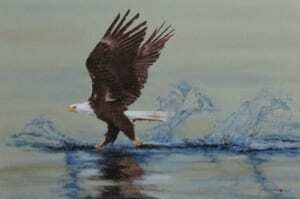 An eagle flies, dance-like, over still, mirrored water. The biologist can define the animals’ kingdom, phylum, class, order, family, genus, and species. The engineer studies the birds’ wings and how they achieve flight. The mathematician calculates the weight of food both mama and cub bear need to maintain optimal health — all very important work. And equally important, Rislove captures the moment, creates the setting, invites the viewer to stop what he or she is doing and enter a quiet, peaceful world. He completes the picture, so to speak, and adds soul to the equation. Keith Rislove is the Pacific Northwest Art Event artist at Wenaha Gallery through Saturday, January 12, 2019.